Hvac Design Tips for Your New Home: Think Outside the Box! Building a new home? Early on in the construction design process is the right time to begin planning that perfect heating and air conditioning system. The design of your comfort system should be one of the items at the "top of the list". If your new home is not comfortable to spend time in, your dream home will not be quite the palace you had hoped. Sure, mechanical systems are not as exciting to plan as the decorative components of a new home. But beginning to plan your comfort system(s) early will save high anxiety later and probably save money now. You can have the Hvac system(s) you have always wanted now. You are building a new home, with all components wrapped up into a new mortgage, which wraps up all costs into the single payment. With an hvac upgrade or complete system redo of an existing home, the costs associated will have to be anticipated up front. With the new home, you can add some of the "bells and whistles" you have been hesitant to add in your old place. And reap the tax benefits now. This is the perfect time to be considering a "unique", or less common hvac system. 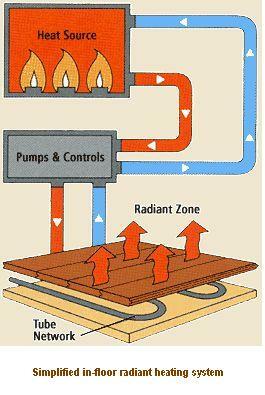 Consider Solar, or Geothermal, or Radiant heating for your home. Retrofitting these types of systems into an existing home can be cost prohibitive. But in new construction, plannned early on, the cost can be kept well within budget constraints. And think about it! Going "Green" not only will make a statement that you are concerned with our environment, but these systems will be more efficient, and pay for themselves over time. Installation of one of these systems will also increase the value and overall comfort of your home. Folks whom have ever lived in a radiant floor heated home, have a hard time ever being comfortable again in a home heated with forced air. Hvac design ideas start with considering the size, style, and locale of your home. A large brick home in Utah will have few common hvac requirements with an adobe home in Arizona. For example, Utah has long cold winters. Not the greatest application for a heat pump . Arizona, however is a great place for installation of a heat pump, with their long hot summers and mild winters. However, a Geothermal system can be a good choice for almost any climate. A bit pricey to install now, but the payback in utility dollars saved is rapid. And then there is bragging rights - priceless! Building a new home will allow you to orient your home's location to best fit your needs. Take advantage of your land's natural characteristics to best enhance the hvac design. Design your home for peak efficiency. South facing windows will help your heating system on those cold winter days. Mature trees? Use them to your advantage by positioning your south facing windows for sunlight in the winter, and shade in the summer. Too often, when building a new home, the comfort systems are where people decide to try and save money. Bad idea! If you scrimp here, as many people do, spending time in your dream home can be a nightmare. You will get what you pay for! Hiring that Hvac contractor simply because he was $3,000 cheaper will get you a system that will, most likely cost you more that $3,000 in lost efficiency, and countless value in comfort. There are plenty of good, honest, skilled hvac tradesmen out there that will provide well-balanced properly sized comfort systems, without breaking the bank. Never deal with the Hvac contractor that does not promote proper hvac design. He will take your money and run! When the system doesn't perform well, he will be gone, or refuse to do anything, without getting into your pockets a bit deeper.